This was the original teaser poster to 'The Ghost of Crowley Hall' investigation and subsequent movie. In early 2007, a small team of paranormal investigators led by Arron Kasady, entered the building to conduct some preliminary tests. Photographs were taken, that produced images of strange orbs in certain rooms, particularly the old children’s nursery. Erratic temperature readings were recorded throughout the hall, and the team had the feeling of being constantly watched. Arron spoke with Daren Marc, a local film maker and friend of Arron’s, about his investigations there. Daren was looking for a project to develop into a feature film at this time, when Arron suggested to him about collaborating on a movie documentary about the ghosts at Crowley Hall. Daren took a little persuading, as this wasn’t really the kind of project he was looking for. When he agreed to co-produce with Arron and direct the film himself, he soon became very eager to make the movie a success. They made plans to go to Crowley Hall with a ghost team and film crew and see what they could sicover there. A ghost team that included a parapsychologist, spiritual medium and journalist, together with the film crew, spent two nights at the hall during the summer of 2007. Throughout the nights, various experiments designed to provoke paranormal activity took place. A major centrepiece of the investigation was a séance, conducted by Arron himself. He wanted to collect conclusive evidence of paranormal activity, possibly even getting photographic proof of the afterlife. The whole event was filmed and documented for the movie 'The Ghosts of Crowley Hall'. As the film crew together with Arron discussed the plans for the evening’s investigation, they went on a walkabout throughout the old hospital. Prior to returning to the Hall, Arron and Katherine had done some more research, particularly to the layout and which rooms Dr. Leys frequented the most. A sitting room was discovered that Leys used to use often, a room that had gone unnoticed the previous time they were there. It was decided that the investigation would be concentrated here. The film crew and Arron’s ghost team set-up ready for the nights filming, doing some walkabouts on camera to some of the areas used in the first part of the documentary, particularly where the séance had been held in the old children’s ward. When it was approaching midnight, it was time to take the crew to the sitting room and see what they could find there. Again, so to not be a distraction from the investigation, a minimal team was used, consisting of Arron, Annabel, Katherine, and of course Daren on camera, to film inside the sitting room. It took Arron some courage to open the door and enter the room, as at this point it was dark, and the hall was already beginning to feel very creepy. This is the full trailer for 'The Ghosts of Crowley Hall' that was released on the internet on 31st October 2007. This was the date that 'The Ghosts of Crowley Hall' was originally intended to be released on, but as the movie wasn't completed, it was decided that the trailer had to be released on Halloween instead. The are actually two versions of this trailer, as one version went out first with the final version following a few days later. This is the final second final version. 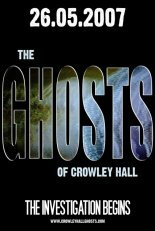 'The Ghosts of Crowley Hall' DVD was first released 14th February 2008, and has so far only been available from the official Ghosts of Crolwey Hall website. 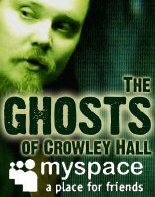 The Region 0 (NTSC) Version of the Movie 'The Ghosts of Crowley Hall' is now available to buy from this site for only $14.99. Be the first to find out what really happened at Crowley Hall during the Paranormal Investigation there in 2007. 'The Ghosts of Crowley Hall' chronicles the investigation of one of Britain’s most haunted halls. The investigation stared back in early 2007, when Arron Kasady began conducting tests by taking photographs. Those photographs produced strange images in certain rooms in the building. Kasady, then began to conduct a full investigation on the haunting of Crowley Hall in May of 2007. During that time, he brought a team of Ghost hunters. The team was comprised of a parapsychologist, a spiritual medium, a journalist and a film crew. They spend two nights at this place. During that time, the team conduced various experiments that were done in order to provoke paranormal activity throughout the building. But things didn’t go right for Arron Kasady and his team, as they had to abort the investigation. LOVEFiLM : Rent unlimited DVDs in the UK for only 9.99 per month. All postage paid. No late fees. No due dates. No strings. No fuss. Free trial period. Filmmaking.net - reference and community for the new and independent filmmaker, incorporating the Internet Filmmakers FAQ, second-hand equipment, filmmaking events, filmmaking sites and services, discussion forums, worldwide film schools, and filmmaking books, software, gear and magazines. The UK Film Council. An international festival of premieres, previews, gala screenings, documentaries, restored classics, short films, artists' film & video, special events, film-maker talks and on-stage interviews, open to everyone at cinemas across London. Play.com - Buy DVDs, CDs, Video Games, Electronics, Books and Ringtones with free delivery to UK and Europe. Play.com is the top site for dvds, cds and games in the UK. We stock all major movies on DVD. The ultimate online starting point for film-makers and film lovers. A search engine featuring exclusively movie-related links. Movie makers, film buffs and film students from around the world call Film-Makers.com home. Raindance is dedicated to fostering and promoting independent film in the UK and around the world. Combining Film Training, Rawtalent, Film Festivals, Reelscene, and hosting the prestigious British Independent Film Awards, Raindance spans the full spectrum of independent filmmaking. Dark MaskFilms are a small independent film company specialising in short and feature length films. Enter the world of dark celtic music and grinding Goth Metal thunder courtesy of Lady Axe. Sign up and receive our newsletter filled with all sorts of news and info about present and upcoming projects!